Here’s a short video of last weeks percussion and guitar sessions for Right Hand Rule. 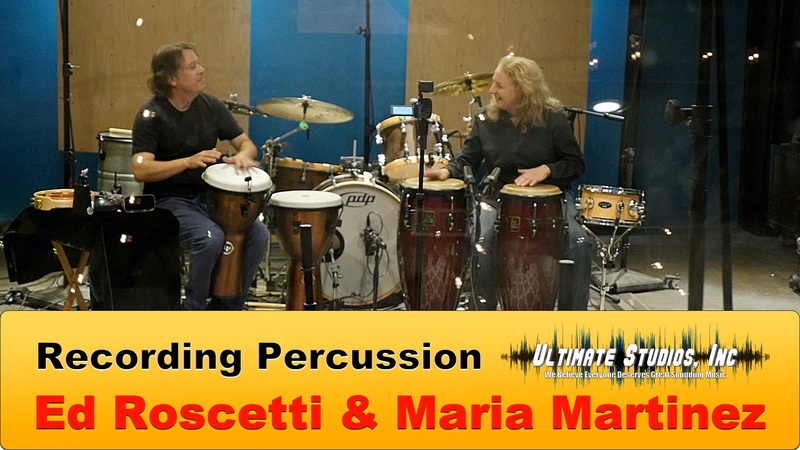 Leslie Jones (singer/percussionist) is laying down some cool congas and Robert Thrall throws down a solo! 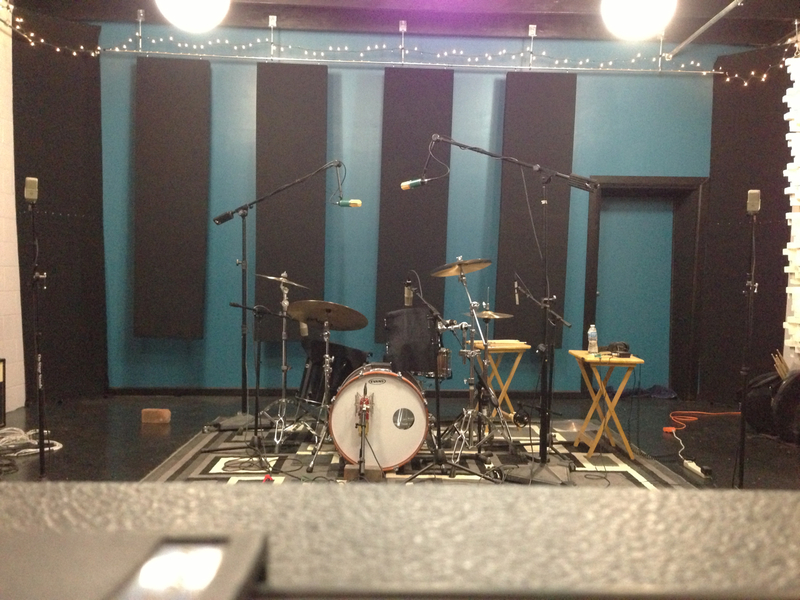 A few photos of the the recording setup are included too! “We had some time to experiment with sounds and decided to use the size of the room to our advantage by capturing the natural ambience of the room. 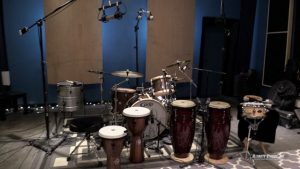 By capturing the instruments this way we are able to set them sonically where we would like them to sit without using lots of processing or digital reverb. It makes for a much more natural sounding recording and also adds a lot of depth. 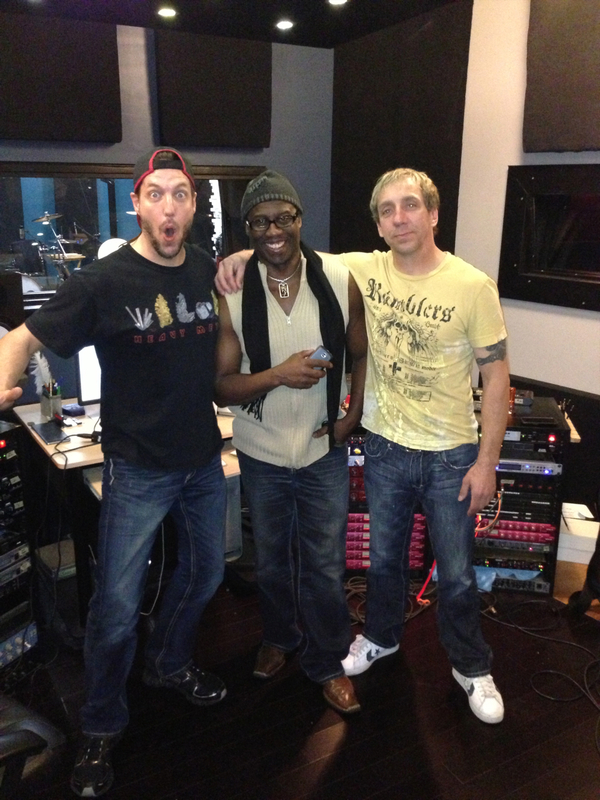 In other words the sounds we capture are pretty much done”, says engineer Charlie Waymire. 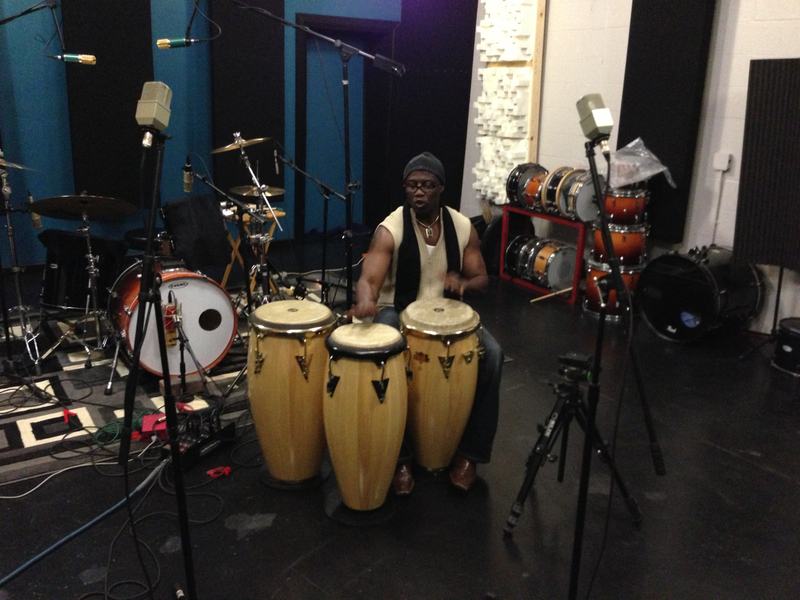 The Congas were recorded with 4 different microphones. 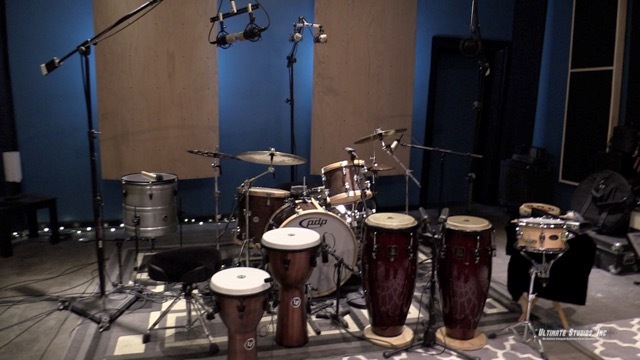 A spaced pair of MXL Cubes about 3 feet out in front of the congas about 4.5 feet off the ground (pictured). The cubes have a really cool vibe. They are kind of dark and gritty and did a great job of picking up the full tone of the congas. There is a Cascade Elroy about 6-7 feet in front of the congas about 2 feet off the ground. The Elroy is set to cardioid and is picking up a lot of the low mid and low frequencies. It really helps to fill out the congas. The placement of the mic was determined by crawling around on the floor and listening for the sweet spot! We also had an MXL V67G up in the corner of the room about 11 feet off the ground to get some real room ambience just in case we needed it. For the guitar solo we had two amps set up. 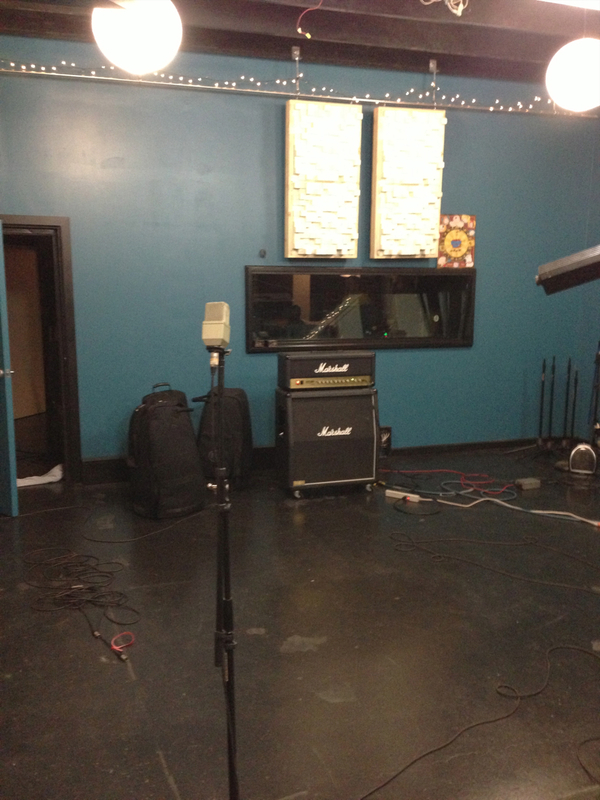 A Fender Deluxe in the ISO booth and a Marshall half stack in the live room. One of the cool things about the studio is the “loop” system that allows us to connect all the rooms in any manner we like. For instance, on this track Rob was in the control room and we ran a line to the ISO both with the Fender and continued that line to the Marshall in the live room. One amp is our tight close sound and the other is purely ambience. 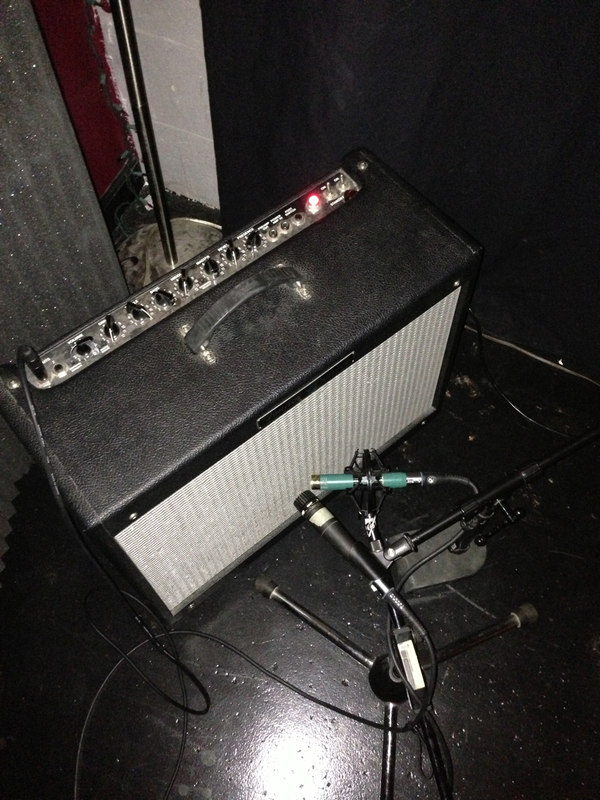 Below is a photo of the Fender Deluxe in the ISO booth. It’s miced with and SM57 on the edge of the cone and an MXL V67i pointing straight across the cone.This gave us a nice focused yet smooth sound. We decided to take advantage of the large live room and capture some natural ambience. We set the Marshall half stack close to the control room wall, cranked it up to excite the room and captured it with a pair of MXL Cubes in a spaced pair about 10-12 feet away from the amp. This gave the guitar solo and awesome sense of space! Below is a photo with the camera sitting on top of the amp head. 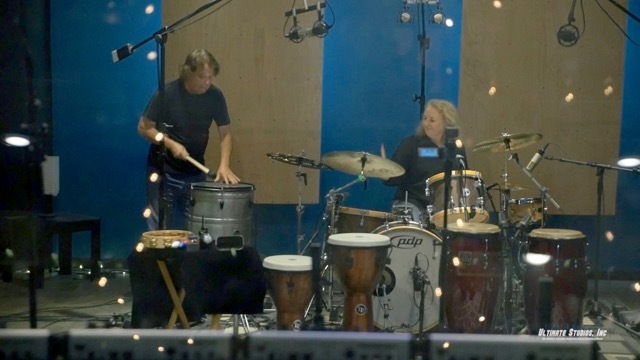 You can get an idea of how the kit was miced for this session too! Photo from on top of the Marshall head with 2 MXL Cube's in a spaced pair about 10-12 feet away. Shot of one of the MXL Cubes capturing the Marshall. It’s very cool to have the room “loop” system that allows us to take advantage of the different rooms.